A 66 year-old female presented to the Emergency Department with shortness of breath and back pain. She had a known dilated aortic root, which was being followed with repeat CT scans. 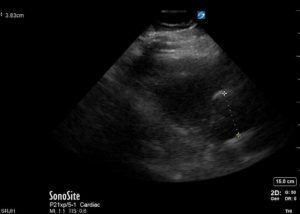 Given the nature of her presenting complaint, a PoCUS was performed to assess her aorta. In order to assess the aortic root, have the patient in a supine position. Either the phased array or the curvilinear probe can be used depending on examiner’s preference. The probe should be positioned with the marker towards the patient’s right shoulder on the anterior chest to the left of the patient’s lower left sternal border. By tilting the transducer between the left shoulder and right hip, long axis views are obtained at different levels with the goal of identifying four main structures; the aorta, the left atrium, and the right and left ventricles. The parasternal long axis view of our patient is shown in Figure 1, where her aortic root measured 3.83cm. Figure 1: Parasternal Long Axis View of Heart: Patient’s root diameter was found to be 3.83cm. 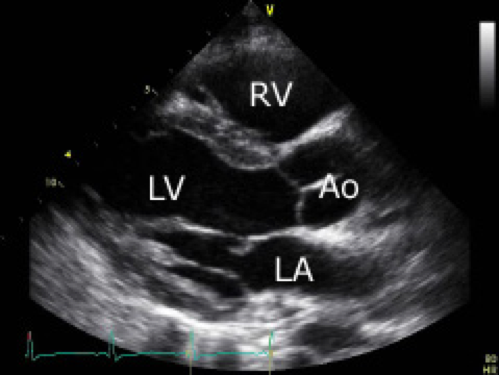 More generally, this view can be used to assess left ventricular contractility and the presence of pericardial effusion, which were not present in this patient. She went on to have a confirmatory CT scan where her aortic root was found to be unchanged from her last scan and was 3.8 cm in diameter as assessed by PoCUS. Although not rigorously studied to assess aortic root dilatation at the bedside, we present a case where PoCUS was reliable in the assessment of the aortic root. There have been other cases of aortic dissection identified by ultrasound in the emergency department setting, however confirmatory studies (either CT scan or formal echocardiography) are still recommended. Labovitz AJ, Noble VE, Bierig M, et al. Focused cardiac ultrasound in the emergent setting: A consensus statement of the American society of Echocardiography and American College of Emergency Physicians. J Am Soc Echocardiogr. 2010;23(12):1225-1230. doi:10.1016/j.echo.2010.10.005. Andrus P, Dean A. Focused cardiac ultrasound. Glob Heart. 2013;8(4):299-303. doi:10.1016/j.gheart.2013.12.003. Perkins AM, Liteplo A, Noble VE. Ultrasound Diagnosis of Type A Aortic Dissection. J Emerg Med. 2010;38(4):490-493. doi:10.1016/j.jemermed.2008.05.013. Bernett J, Strony R. Diagnosing acute aortic dissection with aneurysmal degeneration with point of care ultrasound. Am J Emerg Med. 2017;35(9):1384.e3-1384.e4. doi:10.1016/j.ajem.2017.05.052. Kaban J, Raio C. Emergency department diagnosis of aortic dissection by bedside transabdominal ultrasound. Acad Emerg Med. 2009;16(8):809-810. doi:10.1111/j.1553-2712.2009.00448.x. In order to perform ultrasound of the lungs, there are four views that are obtained (see Figure 1). Place the patient supine. The high frequency linear array transducer is often used, but either the phased array or curvilinear transducers can be used. The first views are taken at both right and left mid-clavicular lines of the anterior chest. 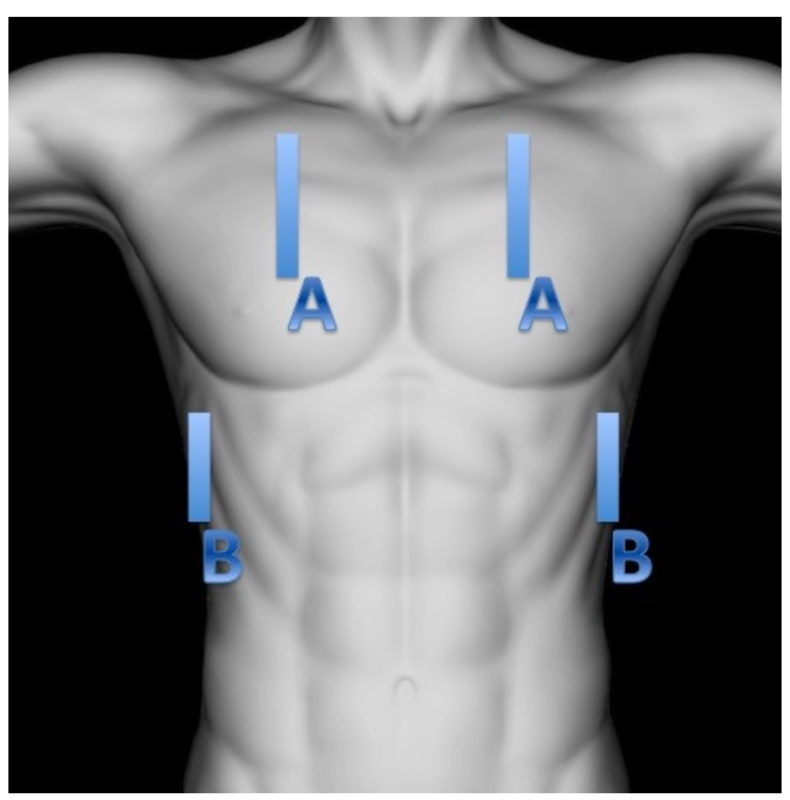 With the marker of the transducer pointed toward the patient’s head, a minimum of 3-4 rib spaces should be identified. The next views are of the posterior-lateral chest. The patient can be supine or in the sitting position. It is these views where a pleural effusion can be identified. 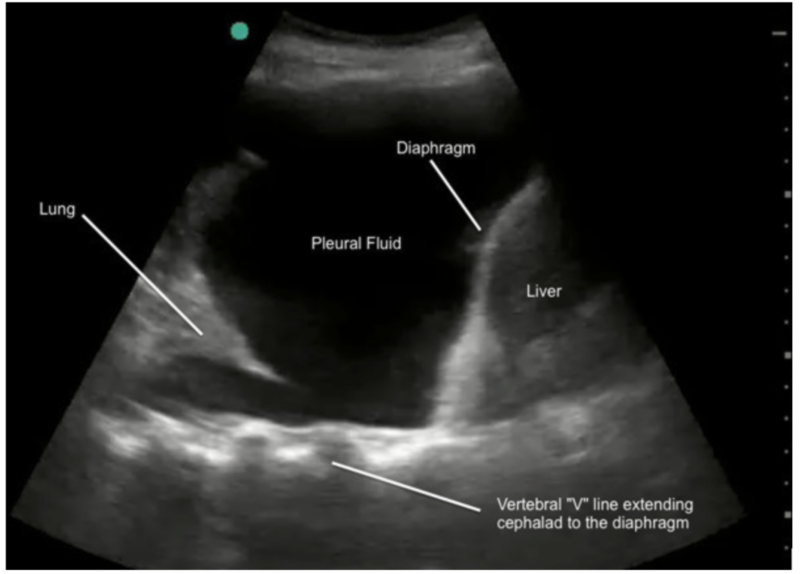 Pleural effusion is assessed by ultrasound placing the transducer in the midaxillary line with the marker oriented toward the patient’s head. On the patient’s right side the diaphragm, the liver, and the vertebral line can be seen. On the left, the diaphragm, spleen, and vertebral line should be in view. In a patient without pleural effusion, one should not be able to visualize the lung as it is mostly air and scatters the sound produced by the transducer. However, in the presence of pleural effusion, the area above the diaphragm is filled with fluid and therefore will appear anechoic. In addition, the vertebral line will be present past the diaphragm as the fluid allows the sound waves to propagate and not scatter. This is known as the ‘spine sign’ (also known as the ‘V-line’). Finally, one is often able to see the atelectatic lung float and move with respirations in the fluid, this is known as the ‘sinusoid sign.’ These are the three criteria outlined by consensus statements in the identification of pleural effusions.1 Occasionally, the area above the diaphragm may look like spleen or liver, but this is known as ‘mirror image’ artifact and is normal.2 Figure 2 shows both the right and left views of our patient. Our patient went on to have a chest x-ray where he was found to have bilateral pleural effusions (see Figure 3). 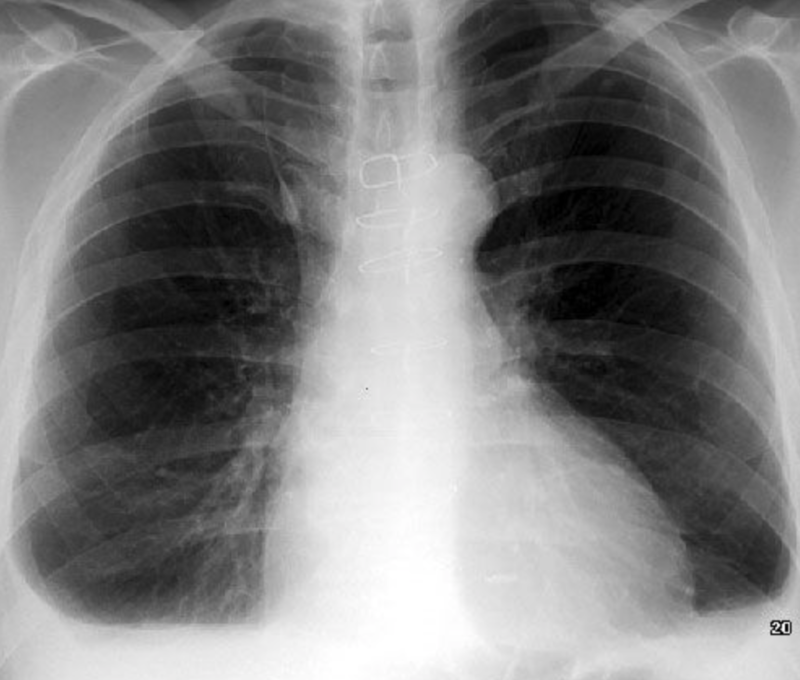 Figure 3: Bilateral pleural effusions seen on chest radiography in our patient. Three criteria are used to identify pleural effusion on ultrasound; anechoic fluid above the diaphragm, the ability to visualize the spine above the diaphragm (‘spine sign’), and atelectatic lung moving with respirations (‘sinusoid sign’). Lung ultrasound for the detection of pleural effusion is more reliable to identify small effusions in comparison to both radiography and physical exam. Volpicelli G, Elbarbary M, Blaivas M, et al. International evidence-based recommendations for point-of-care lung ultrasound. Intensive Care Med. 2012;38(4):577-591. doi:10.1007/s00134-012-2513-4. Liu RB, Donroe JH, McNamara RL, Forman HP, Moore CL. The practice and implications of finding fluid during point-of-care ultrasonography: A review. JAMA Intern Med. 2017;177(12):1818-1825. doi:10.1001/jamainternmed.2017.5048. Wong CL, Holroyd-leduc J, Straus SE. CLINICIAN ’ S CORNER Does This Patient Have a Pleural Effusion ? PATIENT SCENARIO. Jama. 2010;301(3):309-317. doi:10.1001/jama.2008.937. 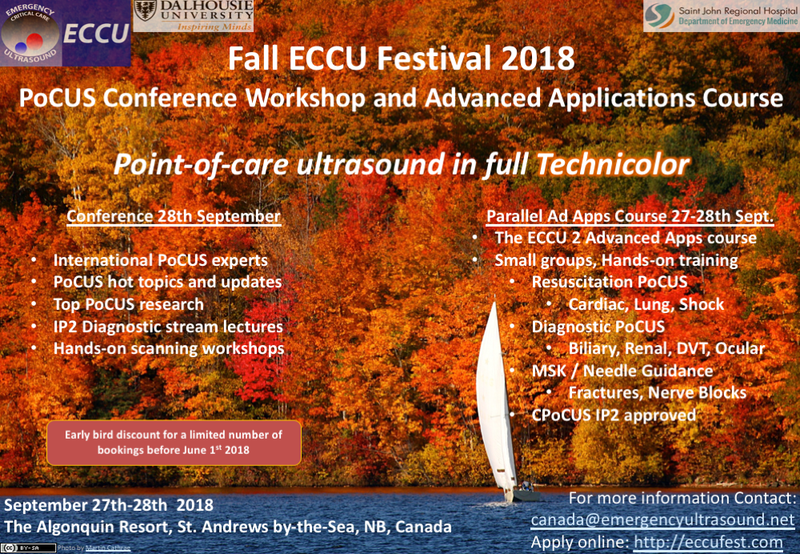 Imagine the reality of PoCUS Artificial Intelligence…..
ECCU IP School 24th November – New Places Now Available! Are you finding it difficult to get your supervised scans for CPoCUS Core IP. We are here to help! We have just been able to open up a few spaces on the ECCU IP School 24th November in Saint John, NB. CPoCUS IP instructors will supervise up to 90 scans in this 1-day session. 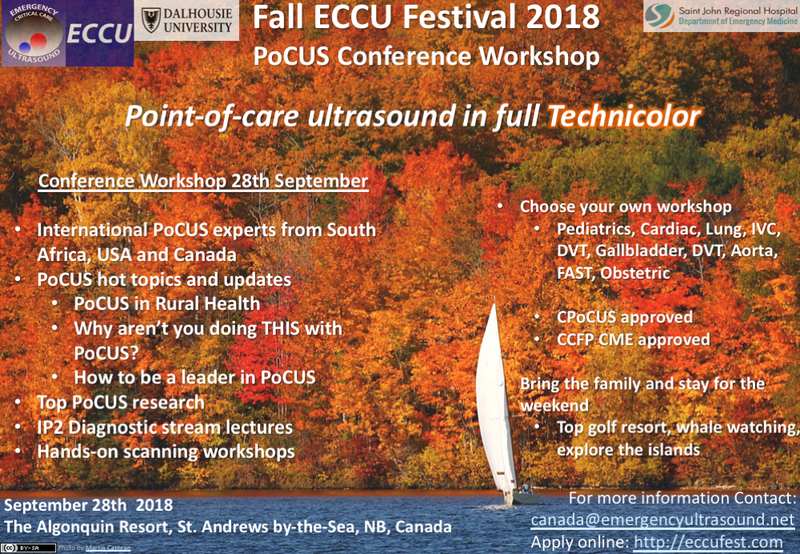 We still have availability for delegates wanting to attend the Fall ECCU Conference Workshop on the 28th September at the beautiful Algonquin Resort in St. Andrews, New Brunswick. Why aren’t you doing THIS with PoCUS? 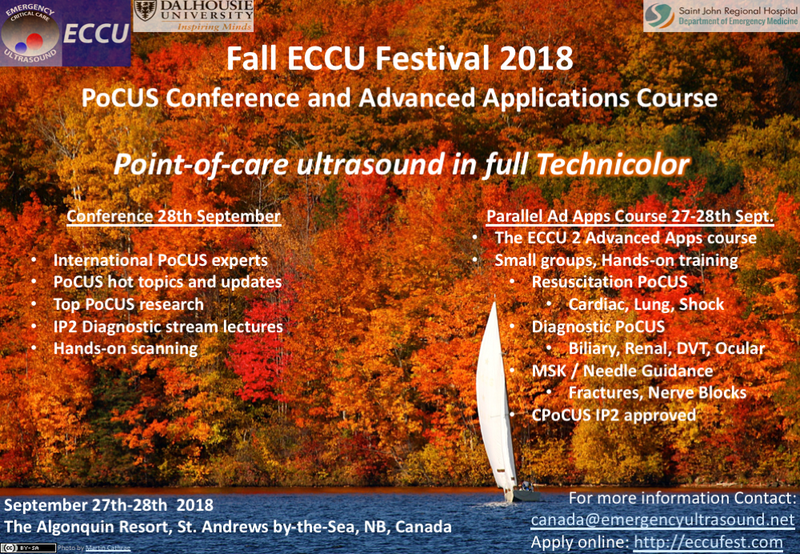 The ECCU Conference is being held in conjunction with the ECCU2 Advanced Applications Course in order to provide those attending the course and other delegates with an opportunity to access an update in the hottest clinical PoCUS topics. The focus will be on presenting the best emerging evidence, strategies for developing a local PoCUS program and developing competencies. “Don’t pull my finger!” – a case of flexor tenosynovitis. You are working a rural ED and a 70 yo male presents with an injury to his right hand about one week ago. He has no known past medical history, is widowed and lives alone. He has no family doctor; a family member made him come in. 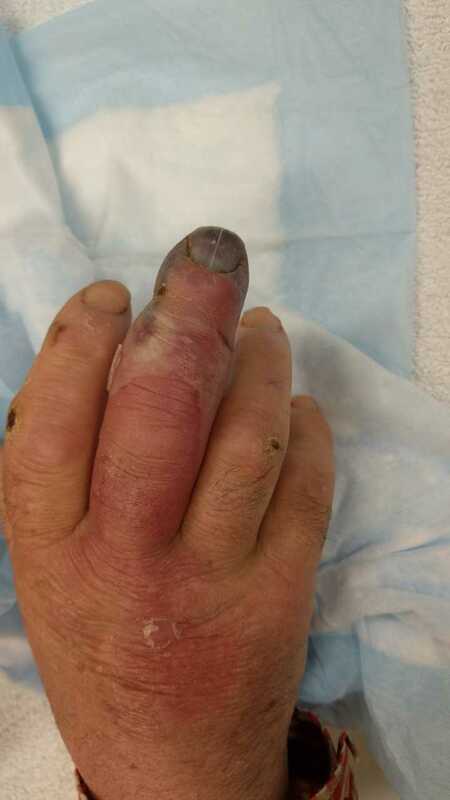 In triage he denies any major discomfort in the finger, and has taken nothing for pain. However he has noticed it is increasing in size, becoming more red and even black in places. Vital signs show he is hypertensive, but otherwise afebrile with a normal heart rate. As you get further history it turns out the injury was a rusty nail to the digit – it just keeps getting better. You are worried about an infectious flexor tenosynovitis – a can’t miss diagnosis. This is when purulent fluid collects between the visceral and parietal layers of the flexor tendon1. This infection can rapidly spread through the deep fascial spaces. Direct inoculation, like this penetrating injury, is the most common cause1. As you can imagine this guy had all 4 signs – slam dunk diagnosis, with a little gangrene at the tip to boot. But the diagnosis isn’t always clear cut, and some of these are late signs of infectious flexor tenosynovitis. Patients may present earlier in the course of illness, so what can we use to help diagnose this condition? PoCUS of course! Place a high frequency linear probe at the wrist crease where you should visualize flexor tendons overlying carpel bones. 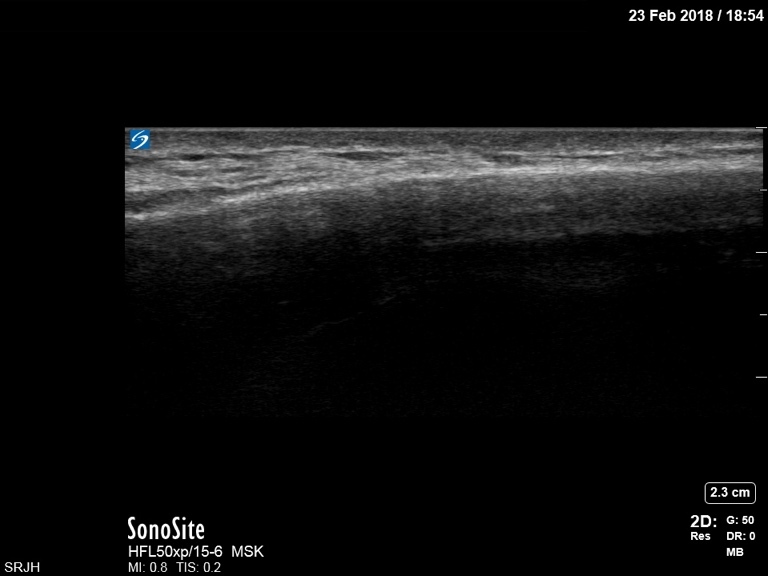 In infectious flexor tenosynovitis you would see anechoic edema and debris in the flexor tendon sheath, and potentially thickening of the synovial sheath. You can assess in both longitudinal and transverse planes. 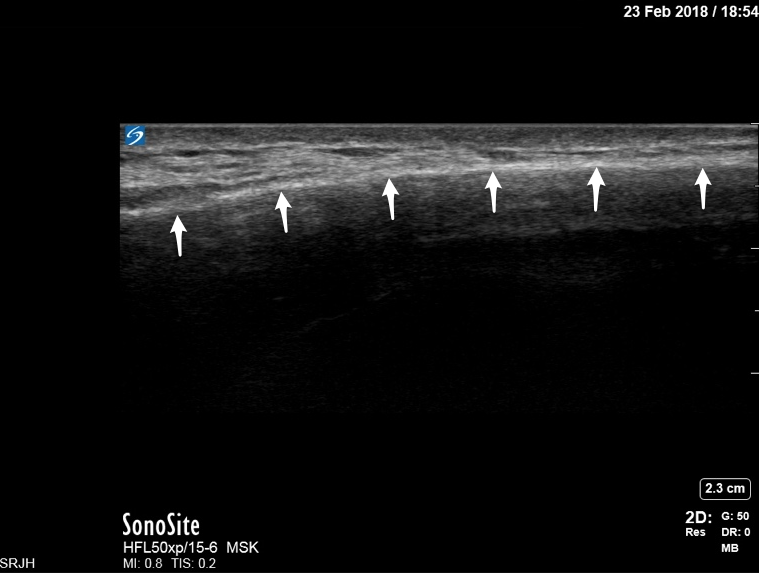 Figure 3: Transverse (A) and Longitudinal (B) images showing edema in flexor tendon sheath1. So the most common bug that causes these infections is Staphylococcus, however they can be polymicrobial2. Broad spectrum coverage is required – think ceftriaxone or pip tazo. If there is concern for MRSA than vancomycin would be indicated. But let’s remind ourselves – he had exposure to a rusty nail – you must cover Pseudomonas as well. We chose ceftriaxone and ciprofloxacin, administered a tetanus (he never had one before) and urgently contacted plastics. He stayed overnight in the rural ED and was transferred out the next morning for OR. Unfortunately, he did have up having the digit amputated but he recovered well. Take home message: Flexor tenosynovitis is a surgical emergency – examine for Kanavel’s signs. Ultrasound can be helpful in confirming diagnosis in the right clinical context. Cover with broad spectrum antibiotics, consider MRSA or Pseudomonas coverage if indicated. Urgent plastics referral needed. Padrez, KP., Bress, J., Johnson, B., Nagdev, A. (2015). 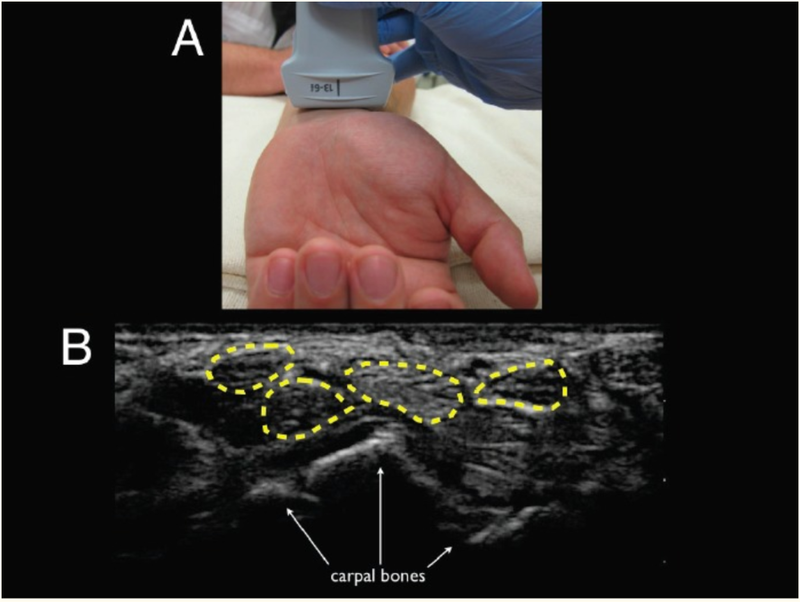 Bedside ultrasound Identification of Infectious Flexor Tenosynovitis in the Emergency Department. West J Emerg Med; 16(2): 260-262. Flexor Tenosynovitis (Karavel’s signs). Sketchy Medicine. Retrieved from http://sketchymedicine.com/2012/10/flexor-tenosynovitis-kanavels-signs/ June 12, 2018. Tintinalli, JE. (2016). Flexor Tenosynovitis (8th ed.) Tintinalli’s Emergency Medicine: A Comprehensive Study Guide (page 1922). New York: McGraw-Hill. Case: A 70 year-old man presented to the emergency department with pain in his left shoulder and clavicular region following a skiing accident. He slipped and fell on his left lateral shoulder while he was on skis at the ski hill. He has visible swelling in his left shoulder and clavicular region, and was not able to move his left arm. On exam: The patient was in no sign of distress. He was standing and holding his left arm adducted close to his body, supporting his left arm with his right hand. There was swelling and ecchymosis in the left clavicle, mid-shaft region, with focal tenderness. On palpation, there was crepitation, tenderness, swelling, and warmth in this region. He was unable to move his left shoulder due to pain. His neurovascular exam on his left arm was normal. Auscultation of his lungs revealed normal air-entry, bilaterally and no adventitious sounds. 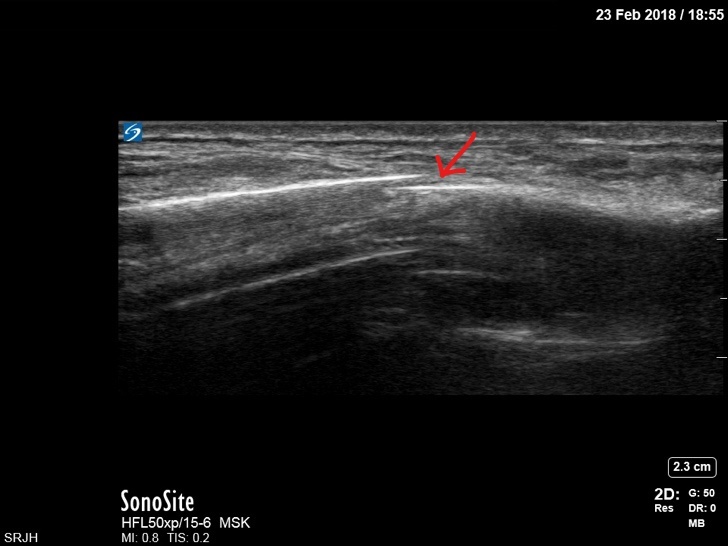 Point of Care Ultrasound (PoCUS): We used a linear, high-frequency transducer and placed it in the longitudinal plane on the normal right clavicle (see Image 1. ), and the fractured left clavicle (see Image 2.). Image 3 shows the fractured clavicle in the transverse plane. Image 1. PoCUS of normal right clavicle along the long axis of the clavicle (arrows depict the hyperechoic superficial cortex with deep acoustic shadowing). Clip 1. PoCUS of normal right clavicle along the short axis of the clavicle. The transducer is moving from the lateral to medial, note the visible hyperechoic curved superficial cortex and the subclavian vessels at the end of the clip. Image 2. 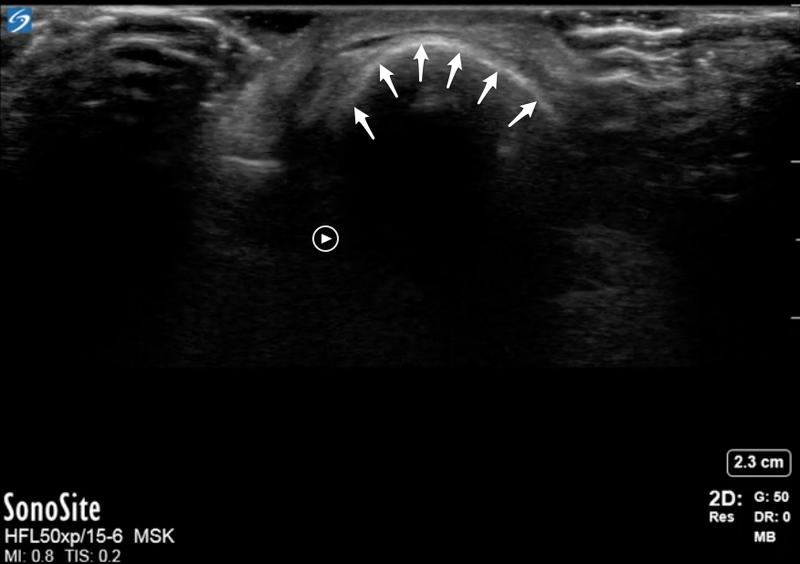 PoCUS of normal right clavicle along the short axis of the clavicle (arrows depict the hyperechoic superficial cortex with deep acoustic shadowing). Clip 2. PoCUS of a fracture of the left clavicle, viewed in the long axis of the clavicle. Compare this view with image 1. Clip 3. PoCUS of a fracture in the left clavicle viewed in the short axis of the clavicle. Compare this view with Clip 1. Note the fracture through the visible cortex and the displacement that becomes apparent halfway through the clip. Radiographic findings: Radiographic findings of the left clavicle reveal a mid-shaft spiral clavicular fracture. (Image 4). Image 4. Radiographic image of fractured left clavicle. 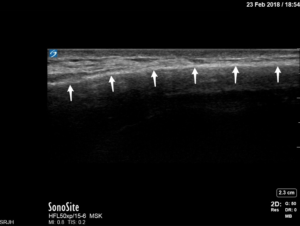 Take home point: Research has shown that Ultrasonography is a sensitive diagnostic tool in the evaluation of fractures (Chapman & Black, 2003; Eckert et al., 2014; Chen et al., 2016). 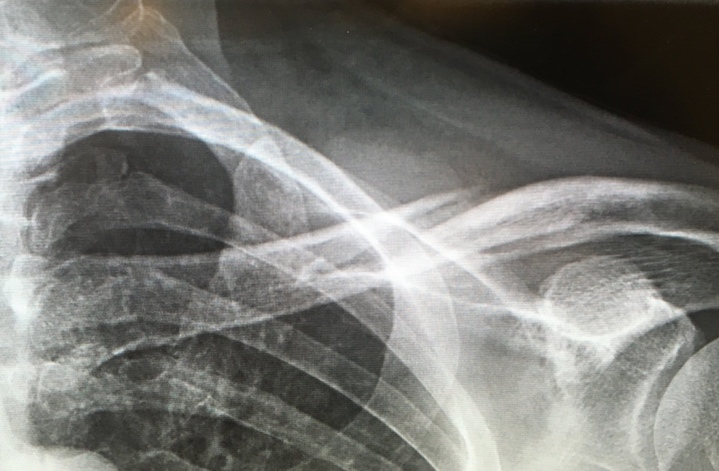 This case provides an example of how PoCUS can be used to diagnose clavicle fractures in the emergency department. In a rural or office setting where radiography is not always available, PoCUS can be used to triage patients efficiently into groups of those with a fracture and those with a low likelihood of a fracture. This would enable more efficient medical referrals while improving cost-effectiveness and patient care. From EMS, through Emergency Medicine, diagnostic and intervention radiology, internal medicine and neurology, Saint John Regional Hospital (probably more appropriately Saint John University Hospital) provides a world class service for stroke patients in New Brunswick. This got me thinking about many of the other innovations and ideas that we continue to push forward locally, especially relating to emergency medicine, and how important it is not to let ourselves become disillusioned by busy shifts, perceived administrative inertia, perceived injustices, crowding and many of the negatives we face, and will likely continue to face for sometime. To name but a few, we can be proud of the integrated STEMI program we have from EMS to Cath Lab, the Point of Care Ultrasound program that leads in this nationally and beyond, the new Trauma Team leadership program, the patient wellness initiatives such as the photography competition corridor that make things just a little brighter for patients, the regionally dominant and growing simulation program, the regional and local nursing education programs, the nationally unique and hugely popular 3 year EM residency program, the impact of our faculty on medical education at DMNB, the leading clinical care provided by a certified faculty of emergency physicians, our website, our multidisciplinary M&M and quality programs, many of the research initiatives underway including development of an ECMO/ECPR program with the NB Heart Centre, improving detection of domestic violence, innovations around tackling crowding, preventing staff burnout, better radiology requesting, encouraging exercise prescriptions, and much more. I was particularly impressed how Dylan explained the integrative approach that was required to improve stroke care, and how that was achieved here. There are many other areas that we can also improve, innovate and lead in. Every day we see ways to make things better. I hope that at this point in our department’s journey, we can continue to make the changes that matter, for patients, our departmental staff, physicians, nurses and support staff alike. I encourage all of us to think of one area we can improve, to plan for change and for us all to support each other to achieve those improvements. Some of our residents are embarking on very interesting projects, such as designing early pregnancy clinic frameworks, models to improve performance under stress, and simulating EMS ECPR algorithms – all new innovations, not just chart reviews of what we are already doing. I encourage us all to support them, and others with these projects, and to begin to create innovation priorities for the department. 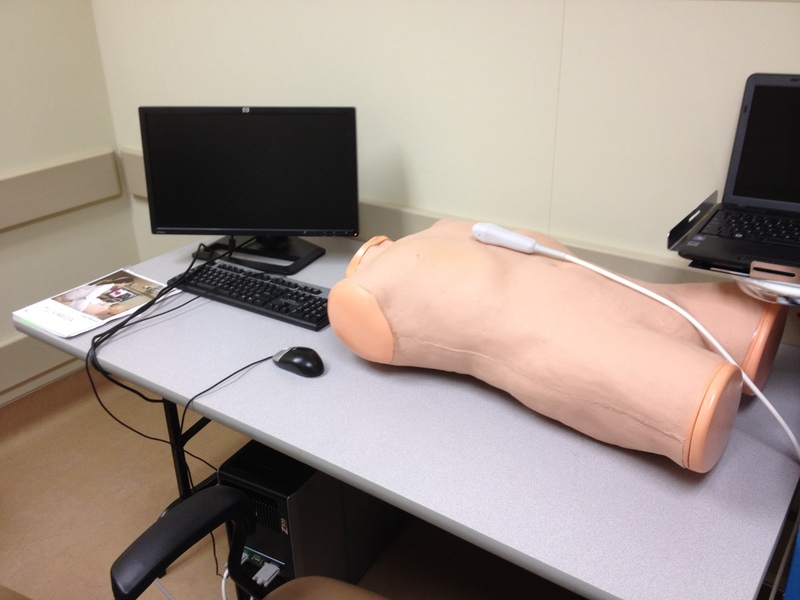 Education: developing lecturing and teaching skills by developing an emergency ultrasound lecture portfolio and contributing to the program’s educational mission. 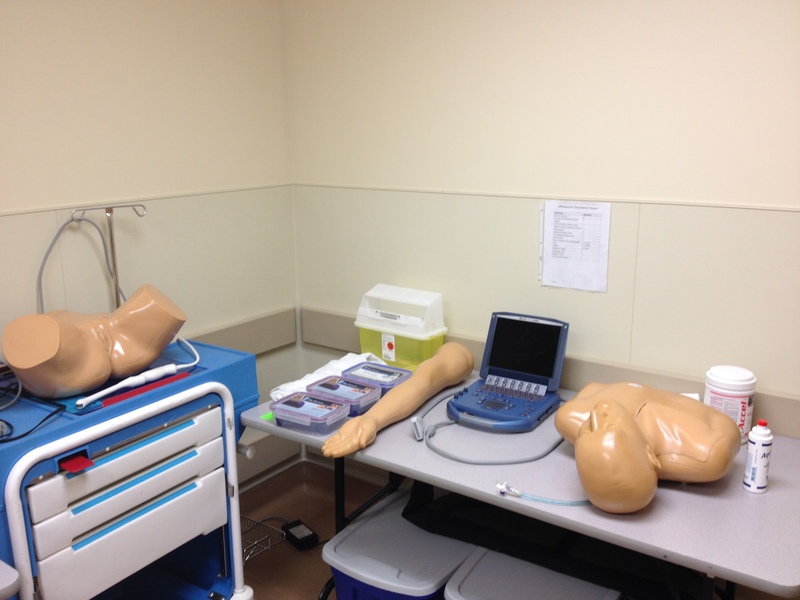 Acquiring expertise at bedside ultrasound teaching and assessment. Administration: understanding the critical components required to run an emergency ultrasound program, set up and deliver educational events/courses and how to best utilize information technologies for image archiving, database management, and quality assurance. Research: understanding the state of emergency ultrasound research by participating in ultrasound journal club activities and developing an independent research project from its inception to publication. Suprapubic aspiration – when the catheter doesn’t cut it. Urine is routinely analyzed and cultured as part of a sick child workup, as diagnosis of urinary tract infection can be difficult in pre-verbal children. 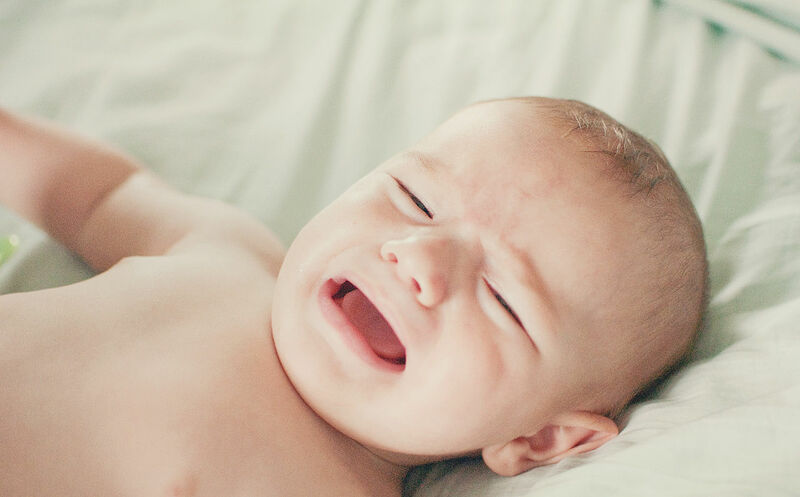 They are unable to “point where it hurts”, and physical exam can be both difficult and unreliable in an irritable or obtunded infant. Urine may be collected in three ways – by “clean catch” collection, transurethral catheterization (TUC), and suprapubic aspiration (SPA). Given the inherent risk of contamination with local flora (over 25% in one cohort study)1, clean catch urine is typically useful only for ruling out UTI. TUC is more commonly performed as it does not require physician participation, but SPA remains a valid option for obtaining a urine sample for analysis and culture in children under the age of 2. It has been shown to have a significantly lower rate of contamination than TUC (1% versus 12%, respectively)1, although failure rates are higher with SPA4. Use of portable ultrasound has been shown to significantly increase the rate of success of SPA (79% US guided vs 52% blind)5. RCP – The pee or not the pee: so many questions! Position the patient supine in frog-leg position, using parent or caregiver to assist with immobilization. 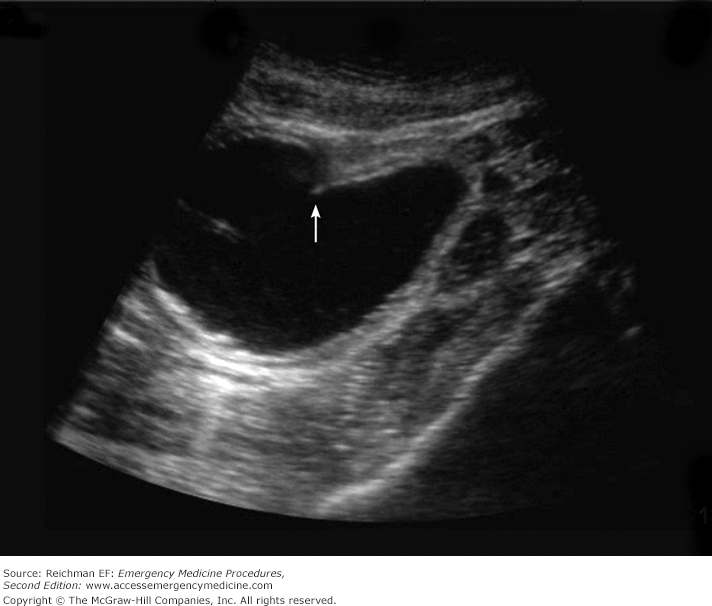 Using sterile technique, identify the bladder on ultrasound; it appears as an anechoic ovoid structure just below the abdominal musculature. Insert the needle slightly cephalad, 10-20° off perpendicular while aspirating until urine appears. If the insertion is unsuccessful, do not withdraw the needle fully. Instead, pull back until the needle tip rests in the subcutaneous tissue and then redirect 10° in either direction. Do not attempt more than 3 times. One sufficient urine is obtained, withdraw the needle and place a sterile dressing at the site of the insertion. Suprapubic bladder aspiration versus urethral catheterization in ill infants: success, efficiency and complication rates. Pollack CV Jr, Pollack ES, Andrew ME. Ann Emerg Med. 1994 Feb;23(2):225-30. Retrieved December 10, 2017. Use of portable ultrasound to assist urine collection by suprapubic aspiration. Gochman RF1, Karasic RB, Heller MB. Ann Emerg Med. 1991 Jun;20(6):631-5. Retrieved December 10, 2017.